Red Seven card counting system is designed for blackjack players of different levels; though it is considered to be the strategy for advanced players, beginners will be also able to understand and use it. Red Seven is a good counting system for everyone who knows blackjack basic strategy and understands the main principle of card counting because it will be quite easy to remember the points which differ Red Seven from other card counting systems, such as Omega II or Zen Count for example. Red Seven System has a very interesting way of counting cards; it gives 4 values for cards: (-1), (+1), (0) and a number to start your counting with (it is not a zero, as other counting systems propose us to count). Well, as you can see, Red Seven counting system advises you counting 7's in a rather interesting way: you should add one point to your count total if you see a Red 7 dealt, but you should not count a Black 7 and give it a value of 0. Maybe it looks strange a bit but such a principle makes it easier for you to count cards, so, it is rather comfortable, is not it? One more difference between Red Seven and other counting systems is the fact that you do not start your counting with 0: you start counting cards with -2 if it is a single-deck blackjack, -4 if you play a two-deck blackjack, -6 if you play a three-deck blackjack etc. 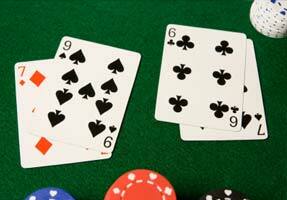 So, if you play blackjack with 8 decks of cards, your starting count will be -16. This step allows you to control the moment when you have an edge during the game: when your count total is 0 it means that it is a high time for you to increase your bets because you get 1% of advantage.